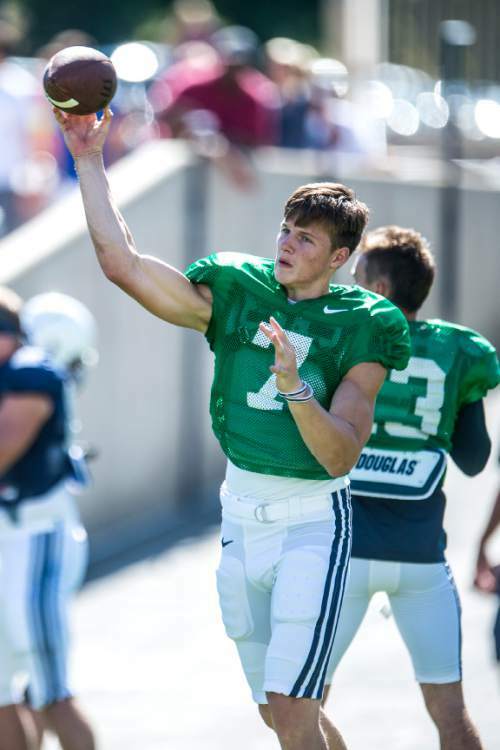 BYU • Freshman Beau Hoge hoped to redshirt, but injuries have changed plans. 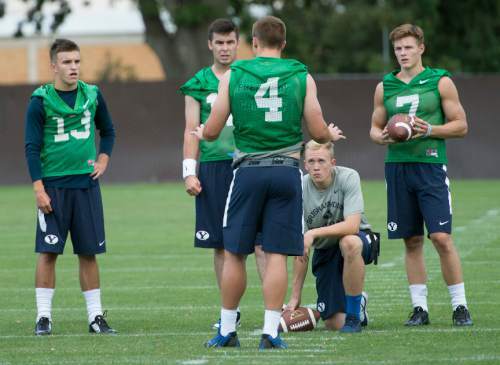 Leah Hogsten | The Salt Lake Tribune Quarterback Taysom Hill talks with fellow backup quarterbacks l-r Koy Detmer, Jr., Tanner Mangum and Beau Hoge during Brigham Young University's first practice of fall football camp, August 8, 2015. Chris Detrick | The Salt Lake Tribune Brigham Young Cougars quarterback Beau Hoge (7) during a scrimmage at LaVell Edwards Stadium Saturday August 15, 2015. Chris Detrick | The Salt Lake Tribune Brigham Young Cougars quarterback Beau Hoge (7) during a scrimmage at LaVell Edwards Stadium Saturday August 15, 2015. Provo • Still recovering from heart surgery, ESPN analyst and former NFL running back Merril Hoge had already gone to bed the night of Oct. 10 when his wife woke him up with some unexpected news. Beau Hoge, Merril&apos;s son, was warming up on the sidelines and getting ready to enter the BYU-East Carolina game for the Cougars because starter Tanner Mangum had pulled a hamstring on the drive that led to BYU taking a 38-21 lead. In some ways, Beau Hoge wishes Angela had let his father sleep; In other ways, he&apos;s glad his father saw his less-than-stellar performance, because he appreciated the advice that would come later. Hoge completed just 1 of 5 passes and threw an interception that set up the Pirates&apos; game-tying 34-yard field goal. "He just kept it simple and said not to throw across the body," Beau Hoge said of his father&apos;s critique of his first college action. "But he knows that I know that. I just had the one boneheaded freshman play in which I was just trying to do too much. Besides that, I felt OK about how I played. It felt good to get a little bit of experience." Hoge and his father were harboring some hope of him redshirting this season, but that pretty much disappeared when Taysom Hill was lost for the season and Mangum was pressed into action earlier than anybody would have hoped. 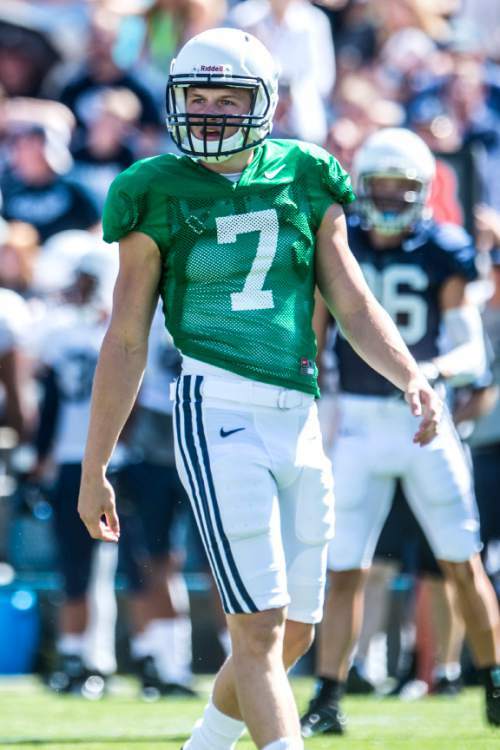 So it will be Hoge, instead of Mangum, who comes on in relief on Saturday when BYU plays in what should amount to a glorified scrimmage against Wagner at LaVell Edwards Stadium. The winless Seahawks (0-6) will quite possibly be the weakest opponent to ever play at LES, although the 0-11 Savannah State team that got just 63 yards in a 64-0 loss last year, 51-0 at halftime, certainly qualifies. Hoge, 6-foot-1, 198 pounds, said it has been like a normal week for him because coaches won&apos;t let anyone look past the FCS opponent from Staten Island, N.Y., that was added to the 5-2 Cougars&apos; schedule so they could get a two-game series with the SEC&apos;s Missouri  one game at Arrowhead Stadium in Kansas City next month and the other in Provo in 2020. "Maybe a couple extra reps here or there, but mostly it is business as usual," Hoge said Wednesday. "You gotta have the first-string guys ready to go first, take care of things they need to take care of, and then we will see how it goes." Behind Hoge on the depth chart is another freshman, Koy Detmer Jr., who also might be looking to preserve his redshirt. "Just like every week, we want to be really sharp, no matter who is in there," Hoge said. "We want to play to our highest level and not play to any other level than that." Hoge, who didn&apos;t play quarterback at Highlands High in Kentucky until his senior year because the Bluebirds had solid quarterbacks when he was younger, attended BYU&apos;s Junior Day in 2014 and caught the attention of quarterbacks coach Jason Beck. "He was more of a sleeper, because he played receiver in high school as a sophomore and junior, but we noticed he had a lot of tools," Beck said. "He can throw it, he can run, and he is very smart. He did a lot of things really well." • Played quarterback his senior year at Highlands High School in Fort Thomas, Ky., after playing receiver and defensive back his first two seasons. • Threw for 3,459 yards and 35 touchdowns and rushed for 865 yards and 26 TDs as a senior. About the Seahawks • Located in Staten Island, N.Y., the school was founded in 1883 and started playing football in 1927. … They won the Division III national championship in 1987 and moved up to the FCS level in 1992. … Coach Jason Houghtaling is 0-6 in his first year at the helm. About the Cougars • They are fifth in the nation in sacks, averaging 3.43 per game. … They have a bye next week, then face San Jose State on Nov. 6 at Spartan Stadium. … Offensive linemen Ryker Mathews, Kyle Johnson and Ului Lapuaho will not play, due to injuries. … They are 59th in the country in total offense, averaging 414.0 yards per game, and 68th in total defense, giving up 392.1 yards per game. About the Seahawks: Located in Staten Island, N.Y., the school was founded in 1883 and started playing football in 1927. … They won the Division III national championship in 1987 and moved up to the FCS level in 1992. … Coach Jason Houghtaling is 0-6 in his first year at the helm.